The product catalog is read-only when accessed from the Sales work area and is maintained in the settings-product catalog work area. Products require a short code product identifier and a one-line product name along with the unit group and default unit item and the decimals supported value. 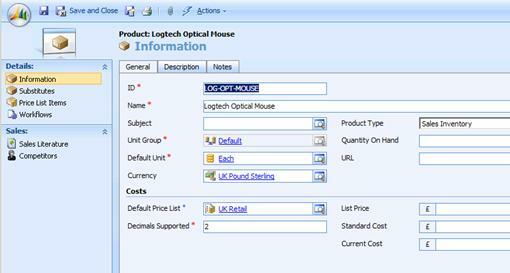 The default currency can be specified, and the price list item then needs to be added before the product is available for use in the sales cycle. 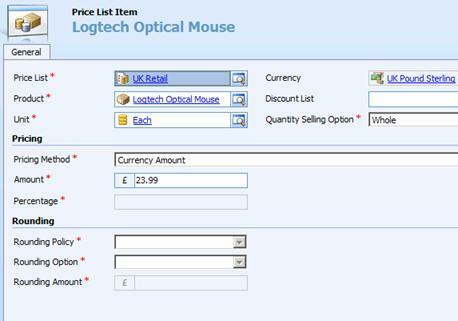 A price list item record must be created (for each currency) before a product is available to the sales process. The list price and standard and current cost are specified in the product record and can be inherited by the price list item records so that a change in the list price would also change all the corresponding price list item records. You can set the default price list for a product once the corresponding price list item has been created. Substitute products can be indicated against a product record and links made to the sales literature and competitor entities. Products can also be defined as Product Kits by selecting the Convert to Product Kit option in the actions menu. A kit has several constituent products to form a bill of materials. Note: The author has developed a program to assist in uploading products into CRM from a spreadsheet or accounts package. See http://www.redware.com/mscrm . Unit Groups and Unit Items need to be defined before products can be added into the system. Unit Groups are designed to reflect categories of measurement, so liquids, for example, might have a unit of one millilitre as the smallest primary unit. Unit Items are multiples of the primary unit, and a unit of one litre might then be defined for liquids. For whole items, a primary unit for a single unit (each) must be defined and other unit items derived from it with tens and perhaps a dozen or a gross defined for multiples of whole units if required. Each product must have a default unit item taken from a unit group that specifies the available unit items permissible for the product. The price list item specifies the pricing of a product, for a particular pricelist (and currency) and unit item. Once entered, the product is available in the sales cycle (for the appropriate currency only) and the default pricelist can be set against the product. · Currency amount specifies a precise amount for the price list item with no inheritance from the product record. · A percentage of the list price can be specified so changes to the product price list are automatically reflected in the price list item. · A percentage markup or margin can be specified on either the standard or the current cost of the product and is automatically updated when the product costs are changed. Note: It can be time consuming to maintain price lists with precise currency amounts and you might want to automate the process or at least use the export and import facilities of CRM to maintain prices in a spreadsheet. Discount lists can be defined to provide discounts according to the quantity ordered. A trade discount list might, for example, apply a 10% discount if more than 100 items are ordered. The discount list can be referenced for each price list term to apply quantity discounts automatically onto a quotation.